As donors, diplomats and development partners gather for this year’s Roundtable Implementation Meeting in Pakse, will they take time to consider those who were arrested or disappeared in this same city in November 2000 and October 2001, simply for expressing their views? Will they recall the students who met similar fates earlier in Vientiane in October, 1999? Development partners: Where are the people? Above is a word cloud generated from the Vientiane Declaration on Partnership for Effective Development Cooperation from the 2015 High Level Roundtable Meeting. Where are the people? The term only appears three times in the document itself, and those are within the Lao PDR’s name. Other terms such as rights, empowerment, participation, rural, ethnic minority, and even core sectors such as education, health or agriculture are also missing. Surely development partners use these words in soliciting resources and reporting on programmes, so why are they so noticeably absent in this important document meant to guide development action for the next decade? While the Lao government claims it is continuing to investigate Sombath’s disappearance, no results have been released in nearly three years. But is anybody still asking? Within days of his disappearance, Sombath’s family filed an appeal with the Supreme People’s Prosecutor. Authorities later claimed the document had been lost. But were attempts made to replace it? Sombath co-chaired the Asia-Europe People’s Forum in 2012, and was abducted soon thereafter. Will AEPF be raising Sombath’s case at their meeting in Mongolia this July? Will Sombath, other human rights issues, or the challenges facing Lao civil society be addressed at this year’s Lao Studies Conference in July? Lao NPAs (and/or the Lao government) declined to host the Asia People’s Forum in Laos this year, in part because of issues surrounding Sombath. Will his plight be discussed at the ACSC/APF in East Timor? The EU and other donors are providing significant support for INGOs and NPAs to follow-up on the Universal Periodic Review, which includes ten recommendations to more seriously investigate Sombath’s disappearance. Is Sombath’s name mentioned in any of this work? Will world leaders attending this year’s ASEAN summit speak of Sombath or the worsening human rights situation in Laos, or will wider geopolitical issues prevail? Will donors accept even more restriction, non-transparency and self-censorship at this year’s High-Level Donor Roundtable meeting? European Development Partners reiterate their strong commitment to promote better lives and the exercise of constitutional human rights for all Lao citizens. We welcome Laos’ acceptance of some of the recommendations of the most recent Universal Periodic Review and we are open to the dialogue on how concerted measures by the government could address its recommendations. In particular, we welcome the government’s reassurance to thoroughly investigate, and report on, the 2012 disappearance of Mr. Sombath Somphone, consistent with international practices and standards. Mr. Sombath has now been missing for over 1,000 days. His disappearance remains an issue of great concern for us. His family is desperately seeking for answers. From European Development Partners’ Statement at Lao PDR’s 12th High Level Round Table Meeting, Vientiane, 27th November 2015. “The working climate of Lao CSOs, which has been restricted by the government since Sombath’s disappearance, is an outstanding issue, so I wonder if development partners … will be willing to raise it. So far, I see that CSOs operate in fear—being threatened by governmental officials,” the official said. Vientiane Declaration ignores rights, people, etc. The Vientiane Declaration on Partnership for Effective Development Cooperation, which will be signed at the High Level Round Table Meeting, departs sharply from the spirit and assurances made during the recent Universal Periodic Review. The document makes no mention of human rights, civil rights or any kind of rights. Civil society, NPAs and INGOs are only included in regard to their role in carrying out the development agenda. While there are over 50 references to government, and nearly 40 to partners, there is little reference to the Lao people. The document does not include the word population. Citizens are mentioned only in terms of receiving services. Indeed, people are only mentioned twice, and those are within the Lao PDR’s name. The only reference to community is that of international donors. Ethnic groups or indigenous populations are not mentioned. As you prepare for this year’s High Level Round Table meeting, we ask that you take a few moments to read and reflect on the address below that Sombath Somphone gave to the 9th Asia-Europe People’s Forum in Vientiane, Lao PDR three years ago. It was Sombath’s last public address before he was taken from a busy street in the city where most of you work every day. We ask that you quote his words in your remarks at the RTM itself. More importantly, we ask that you incorporate the wisdom of those words in your policies and programs in the Lao PDR. If assurances given at one Round Table are not important at the next such meeting, of what utility is the Round Table process? Donor countries to Laos have pressed the government of Prime Minister Thongsing Thammavong on the whereabouts of the country’s most prominent civil society leader who disappeared nearly two years ago. European and U.S. development partners mentioned the case of Sombath Somphone at a roundtable meeting with members of the Lao government last week in the capital Vientiane, during which they discussed the country’s progress and challenges in implementing various development goals. The civil society leader went missing on Dec. 15, 2012, when police stopped him in his vehicle at a checkpoint in the capital. He was then transferred to another vehicle, according to police surveillance video, and has not been heard from since. At last year’s RTM we raised the issue of the unexplained disappearance of Mr Sombath Somphone. We were re-assured by the government that it had taken all steps to continue the investigation and to bring the perpetrators to justice. 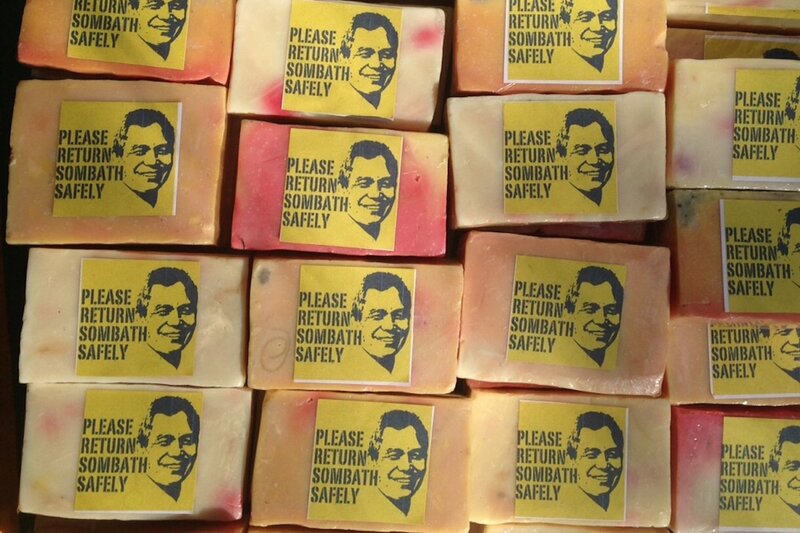 One year later (and almost two years after the disappearance occurred), we note with grave concern that no progress has been made and Mr Sombath has still not returned to his family. Once again, we urge the government to resolve this case urgently. …we encourage the Lao government to consider shifting to a growth model that is more quality-based and in line with a sustainable management of natural resources, reducing the negative effects of climate change and ensuring food security. “Green growth” does have enormous potential in Laos if the right incentives and regularly frameworks are put in place. This would also support social inclusion including for the growing number of young people that enter the labour market. …a more sustainable model of growth…better management of natural resources…more social inclusion, particularly for young people… Who had been advocating these things for years before being disappeared?